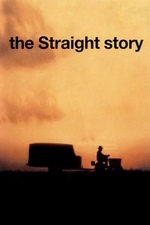 AGAIN I suggest we all read Tim Krieder's essay on The Straight Story before we proceed (spoilers for almost all of David Lynch's films) " David Lynch tells the ugly truth in The Straight Story not in words but in images, powerfully suggestive visual metaphor. " DID EBERT LIKE IT? " The faces in this movie are among its treasures. Farnsworth himself has a face like an old wrinkled billfold that he paid good money for and expects to see him out. " A charmingly retro David Lynch fansite with a True Fan(tm)'s obsessiveness. I know the guy who cowrote this. I-what? Does he talk about it? Interview with Mary Sweeney, Editor, 'The Straight Story' [she is also the co-screenwriter with Madison video producer/columnist John Roach, who I presume is who Madamina knows). Sweeney, a Madison native, has a child with Lynch and was briefly married to him, in addition to creatively collaborating with him over nearly three decades. In any case, Straight was deceased by the time they acquired the rights to his story, so their retelling is based on interviews with people who knew him as well as traveling the route themselves. I remember when this happened; it made the national news, but just the surface details which make it sound like a crazy stunt instead of a very practical adaptation to circumstances. In reality, which the film makes clear, it's almost like a real instance of how Forrest Gump was depicted as a progenitor of the running "fad" (as the movie frames it). Which is not to trivialize it, but to valorize it as a powerful depiction of humanity, something FG was only attempting to draw. Anyway, I'm also fairly familiar with parts of the route, and I have family roots in Iowa (the Cedar Rapids area, though), so it felt very right to me in a lot of ways. One thing I notice being from the flyover is that people on the coasts rarely get us well enough to write about us properly. I really loved this movie and see it as a true work of genius. When an artist says so much with so little, I count that as a success. Reading the article from Film Quarterly now. Good, smart stuff. This movie is so dang pure.